Wisconsin Equestrian Center – We specialize as a full service dressage boarding, lesson and training stable. WEC is a premier equine facility located just outside of Green Bay in Northeast Wisconsin. We specialize as a full service dressage boarding, lesson and training stable. Although dressage is our main focus, we have boarders with varied riding interests including jumping. All breeds and disciplines are welcome! Wisconsin Equestrian Center offers a full care horse boarding service and does not charge “extra” fees. This ensures that every horse in our care receives excellent everyday care and proper equine management. Wisconsin Equestrian Center offers lessons and training for horse and rider in a positive, supportive and professional environment. WEC is nestled among 80 lovely acres. We provide outstanding facilities for both horse and rider, including 3 large outdoor riding arenas (one for general riding, dressage and jumping), a cross-country course, and large grassy paddocks/pastures for turn out. Stable amenities include spacious stalls, dutch doors and a large indoor with great footing. Our staff is experienced, knowledgeable, and caring. 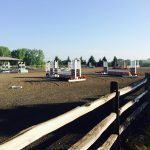 Wisconsin Equestrian Center regularly hosts schooling and recognized Dressage shows, a Hunter/Jumper Show, Pony Club Events as well as dressage and jumping clinics.